In case you were expecting something relatively normal on the 'Private Midnight' soundtrack CD, please allow me to dash those expectations. His band is Clamon, including Saknussemm himself, Paul Nunns, Nel Staite (Lead Vocals),John Davey (Saxophone), Evil Steve, Tortoiseshell Male, Stef Koumouris (Piano/Wayward Heart), David Picone (Drums/Wayward Heart) and Steve Wilfred (Guitar/Let the Creatures Loose). Do note that one of the chapters of 'Private Midnight' received First Prize in the 10 Minute Play Category of The Missouri Review's first Audio Competition. While there are some standard songs on this CD, you're going to find stuff that's a lot stranger than you might imagine, just like the novel. You can download the entire CD from this link and hear for yourself. It had been too song since I last spoke to Lou Anders, editor for Pyr Books. And as I dug through some titles that had been hastily moved out to the garage, I came across some work that jumped out at me as belonging in my Steampunk week. Chris Roberson's 'End of the Century,' for example. Once Lou got out of an apocalyptic traffic jam, I got him on the phone to talk about steampunk, Roberson and whatever else came to our minds. As the editor of the Pyr imprint, Lou Anders is a busy guy. He's putting out some 30 books this year, and his mucky-mucks want more. And here's the big surprise, because as publishing seems to be collapsing around us, science fiction imprints are springing up all over, and doing quite well thank you very much. I talked to Lou about Pyr, some upcoming titles, steampunk and not-steampunk in a conversation you can hear by following this link to the mp3 audio file. Some interviews really surprise me, and I must say that both Nancy Chen and Sarah Powers managed that. 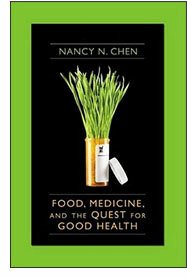 Nancy Chen's book' 'Food Medicine and the Quest for Good Health,' seemed like a book and interview that were destined to be. I've been heading down this path for along time, so to meet and speak with her about her synthesis of these three themes was almost like being re-incarnated. 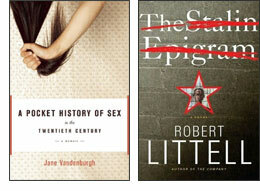 Sarah Powers, on the other hand, offered the pleasures of the completely unknown. I'll admit that I was entirely and pretty much deliberately unfamiliar with yoga until I spoke with her. My wife had attended a yoga class, but that was the extent of my knowledge. So to sit down with Sarah Powers and just ask, straight out, "What's yoga?" was really refreshing. You can hear the MP3 of my broadcast Agony Column Radio show from February 8, 2009 by following this MP3 audio link. 04-13-09 : A 2009 interview with Phil Austin and Nick Danger : "That third eye is real"
It's just a little less than two weeks until the Firesign Theatre shows up here in Monterey to do a live show at the Monterey Golden State Theater, and I was fortunate enough o be able to get Nck Danger himself, AKA Phil Austin, on the phone to talk about the Firesign Theatre and his work as Nick Danger. 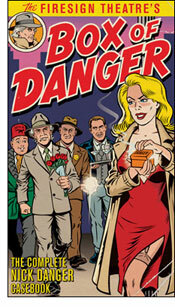 I was delighted to learn the genesis of Nick Danger — Johnny Dollar. When you talk to Austin or the rest of the group, it's really clear why the Firesign Theatre's work is amazing as it is. Listening to tracks like "The Further Adventures of Nick Danger" or "Everything You Know is Wrong," you start to wonder just how much background research was done. The flow of the audio is incredibly dense and layered, and on one hand, it sounds as if they made the whole thing up in one swell foop, live in the studio. That's because the alternative is that they spent months researching and rehearsing the work, performing it hundreds of times and doing thousands of takes then carefully assembling these from four track tapes to an audio experience that sounds like a big-budget movie sans visuals. And the best part is that, as when reading, the listener gets to put it all together in the listening experience. Hearing about the origins of their work, such as the story of Johnny Dollar, just makes it that much more interesting. In "Yours Truly, Johnny Dollar," Johnny Dollar was an insurance investigator who started the show with a phone call, and went on to solve the crime. But he didn't have the advantage of a Third Eye. Turns out they did do all the research, for example, into world of flying saucer believers for 'Everything You Know is Wrong' and the world of 1930's radio detective serials for the Nick danger pieces. You can hear my conversation with Phil Austin in this MP3 audio link. But wait — there's more! Following the interview, I'm podcasting the entire 28-plus minutes of 'The Further Adventures of Nick Danger' from 'Danger Box.' In a sense I should apologize, because as with some of the books I recommend, I suspect some listeners will find themselves compelled to dive into the Firesign Theatre's entire oeuvre. If you get a chance, see them live. If you do, just Don’t Crush That Dwarf — Hand Me the Pliers.